And it's open! The new Sports Park is everything we hoped for ... and more. Posted by Teresa Mihelic HelpDesk on Sunday, February 26th, 2012 at 9:14pm. And so it opened. The almost $32 million new San Clemente Sports Park, the Vista Hermosa Sports Park is a dream come true. This shouldn't be called a park, as it is more than that. It's an amazing sports complex, with an incredible aquatics center, universal access playground, three baseball fields, two soccer fields, a football field and a multipurpose field within its 45 acres. Everything has being finished with attention to details. 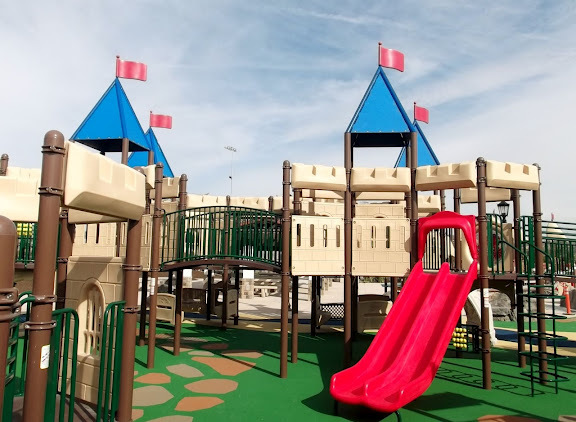 Hundreds of kids were delighted in the playground, the Courtney's SandCastle's sailing-ship structure, its castle structure or in the aquatic play structure in the fun pool, with water slides. Courtney's Sandcastle's: is a very special playground: it is a 30,000 sq ft universal-access playground and it serves children of all abilities, and is especially designed for children with physical, mental and sensory disabilities. The playground will also help disabled adults who can use the playground features for therapeutic purposes. Phase 1 is now open and phase 2 will include a sensory garden with aromatic plants, a musical pathway and several water features. San Clemente Playschool: a new program for kids 3-5, ran by the city of San Clemente at the park, that includes theme activities with sessions full of music, art, games and story time. Spring Break Active Adventure Camp: looking for something for your kids for spring break? Swimming, water polo, soccer, flag football, trail hikes and more and part of the activities programmed. For $180 for the whole week, April 9-13, this is a great program at the Aquatics Center. Having this amazing sports complex is reason enough to want to live and be able to use this facilities in San Clemente. Not to mention the wonderful weather and beaches nearby. Check out the available homes in San Clemente, and the real estate in Talega which is the closest neighborhood to this wonderful facility.